Aluminum bodied brake master cylinder with see through reservoir eliminates having to remove the cap (and introduce air and contaminants) to check fluid level. Unit weighs under 2lbs compared with 6+lbs for the stock cast iron piece! Choose from 15/16ths, 1" or 1-1/16ths bores. Aluminum master cylinder with see through reservoir. 2 x 15" lengths of 3/16ths hard line with correct fittings to plumb the master cylinder. All you need to do is bend lines to desired location and flare 1 end of each tube (the other end ships flared to fit the master). Bench bleeding kit complete with instructions. 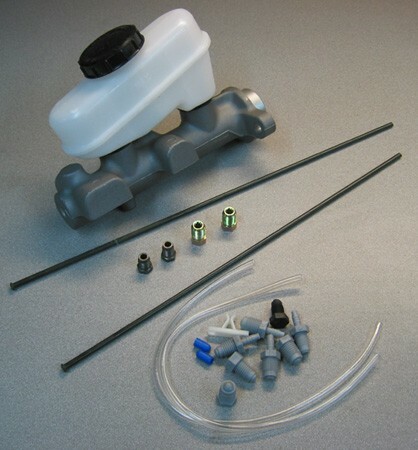 Master cylinder installation instructions & plumbing guide. 1965-73 Mustangs and other Fords with the same bolt spacing (no modification to stock firewall needed). Body measures 7-11/16ths long. I have a 1966 Mustang that spends most of its time open tracking. I just replaced my old MC with this new 1" bore. I have 12" discs up front and the stock 10" x 2" drums at the rear, this new MC works GREAT!! I have more adjustability due to the piston activating the brakes at the start of the stroke. Combined with my adjustable rod, I can fine tune the height of the brake pedal to the height of the gas pedal. Makes heel & toe downshifts much easier.